It’s the final stop on the road to Homecoming and it goes down TONIGHT! 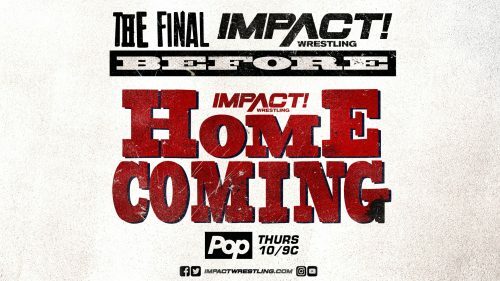 Don’t miss IMPACT Wrestling 10pm ET! The action insane in this wild 10-man tag team matchup pitting the team of Rich Swann, Willie Mack and The Rascalz vs oVe, Matt Sydal & Ethan Page! After their riveting 10-man tag team matchup, Sami Callihan & oVe CRUSH Willie Mack with an All Seeing Eye THROUGH A TABLE! Tommy Dreamer hears enough of Eli Drake’s rant and storms the ring before being joined by career rival RAVEN! Scarlett Bordeaux continues her talent search, presiding over the action as Desi Hit Squad takes on KM & Fallah Bahh! Friends become foes as Kiera Hogan squares off one on one with her former friend, Allie! Jordynne Grace hits the ring to save Kiera Hogan from a vicious beatdown at the hands of Su Yung & Allie! After demanding top competition from IMPACT management, Trevor Lee may have bitten off more than he can chew against KILLER KROSS! Killer Kross makes a terrifying example of Trevor Lee after their match, crushing a CINDER BLOCK on Lee’s head! Pentagon Jr & Fenix, aka Lucha Bros, square off in a massive tag team main event against Johnny IMPACT & Brian Cage! After losing to the Lucha Bros in the main event, Johnny IMPACT & Brian Cage try to tear each other apart, creating a chaotic scene!